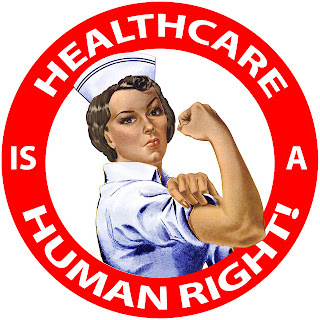 ..:recycled minds:..: Can Health Care be a Human Right? Everyone has the right to a standard of living adequate for the health and well-being of himself and of his family, including food, clothing, housing and medical care and necessary social services, and the right to security in the event of unemployment, sickness, disability, widowhood,old age or other lack of livelihood in circumstances beyond his control. This declaration, however, leaves it unclear exactly how far these rights are extended. Does the right to medical care include cancer treatment? Does it include mental health care services? Does it include a monthly check up? The implications of the universal right to health and medical care are steep: health services must not simply be available, they must be freely available to all people at all times. Under this framework, the concept of health and health care as a human right has not been widely accepted around the globe. How then, can we begin to move towards making this right a reality? In the U.S., most people would tend to agree that some rights should be extended to everyone - it’s the rights however, that are not agreed upon. While some basic rights, especially those guaranteed by the Bill of Rights, are relatively easy to agree upon, access to health care remains a contentious issue. Even in more socially-minded countries, where national health systems exist, the quality and content of care varies greatly. Further, the problem of what constitutes human rights quickly becomes a hot-button issue when national resources are brought into the equation. Health care services are not an unlimited resource, and in fact, are quite costly in terms of equipment, medicines, and service provision. It remains unclear what amount of public resources, in terms of budget allocation to fund public programs, would be needed for such an endeavor, and popular and political acceptance of such a project remains elusive. The concept of health care as a human right becomes even more complex when national boundaries and migration come into the picture. The effects of globalization have served to increase the flow of goods and people around the globe, and the public has readily accepted the access to those goods. The flow of people however, is less well received, despite the reliance of moveable goods on the simultaneous movement of people. Moving people, i.e., immigrants, are often characterized and perceived in negative terms, as using up resources and taking up valuable jobs. These types popular perceptions, perpetuated in the media, are then played upon by those in the political realm who utilize such rhetoric to gain votes and a place in office. Popular ideas of who is deserving – and who is not deserving – of such services as health care thus become reflected in public policy. Given this situation, policy change in favor of human rights – especially for poor people and immigrants – remains a difficult if not impossible challenge to achieve. In short, health care as a human right is not a widely supported concept, and thus finds little integration into state policy. Universal access to health care is not likely to occur until the public discourse on the subject changes. This discourse likely needs to revolve around issues of deservingness and citizenship, and the polarizing rhetoric that maintains such divisions in the popular mind must be discounted as the neo-racist, classist arguments they are. I couldn't agree more with you about the current discourse surrounding health care. I also find it a difficult issue to come to a clear opinion about, besides issues of deservingness and citizenship. And that is because of the role of the government, and how much we can trust them to put people over power. Insurance companies are obviously not the answer either, as their interests lie purely in profit-making, at the expense of sick people who are less able to make money to be able to afford insurance. The whole system is in the toilet, and I don't know what the answer is. That would be like the ultimate welfare program. But if other countries can do it, why can't the US? This is a good place to start really. We need to first agree on what rights people have in terms of their health and access to health care. If we agree with the UN Declaration of Human Rights, then we have a lot of work ahead of us to uphold the right of access to health care. If the answer is more complicated, then we need to start breaking it down and figuring it out. And that's just not happening. Not with the insurance companies and anti-social-program politicians in the picture. In my opinion health care should be a human right and every kind of disease should come under it and there should be complete routine check up at regular intervals which can avoid a lot of problems. Selecting your job defendant on the rapidly developing area associated with medical will really offer you some very nice possibilities to cultivate as part of your job, nurse educator and you could have options that you just wouldn't imagine could well be on hand. This is such a nice post. Every and each human has a right for having a good health and healthcare. Health such an assets for human being. 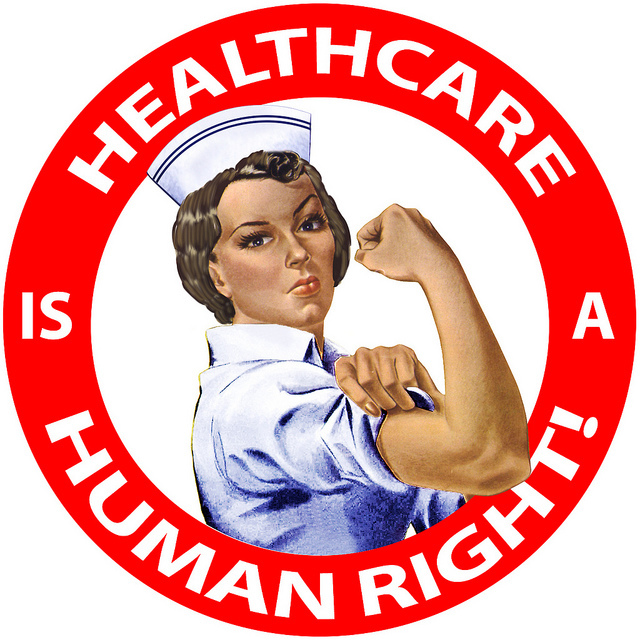 I think Health Care sould be a human right.